Just as we expected, the Eastern Conference race would be won or lost in Red Bull Arena last night. For Sporting Kansas City, they delivered a decisive blow to the race as they handed the Red Bulls their first loss at home this season. A big time to do that with New York being just two points back to start the game. Now we head into the weekend schedule that puts plenty on the line in terms of the playoff race. 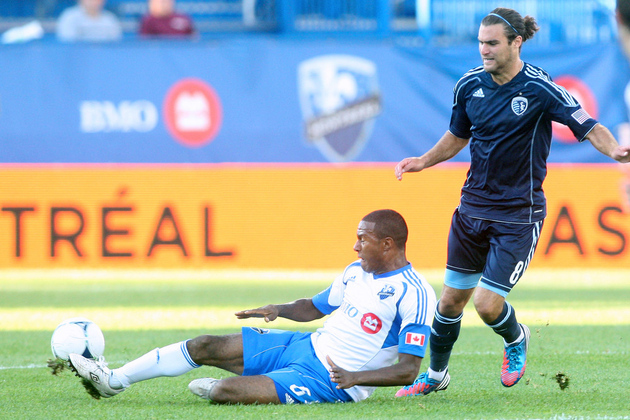 Time to dive into the items to watch for this weekend in Major League Soccer. 1. Double dips. Several clubs have the dreaded Wednesday-Saturday, or even Thursday-Sunday double this week. At this point in the season most of the clubs are used to this kind of scheduling. New York dropped a big game last night at home and will have to re-group in New England. Columbus did just enough late to get by Chivas USA and will now head to Chicago for a massive (no pun intended) game on Saturday and Sporting KC hopes not to fall victim to Montreal’s tough home record at Stade Saputo. Double dips also extend outside those who played in the league last night (or tonight too). The Houston Dynamo, Real Salt Lake, the LA Galaxy and the Seattle Sounders all had CCL games to deal with this week and all three were on the road for them. Tough break to have to head back to the States after being in Panama, Puerto Rico, and Honduras, respectively. Houston is the only lucky one of the bunch that got to stay at home for their CCL game. 2. The Trap at Saputo. Let’s face it, winning on the road in New York last night wasn’t going to easy for Sporting Kansas City but lucky for them the Red Bulls made it easy on them. New York came out with very little width in their midfield and Sporting took full advantage of it by using their pace to control the game. Now things get a little more tricky for Peter Vermes’ club. They head to Stade Saputo, a venue that has gobbled up some of the best club in MLS this season and caused them to do things we wouldn’t expect. Seattle struggled there back in the summer, New York dropped a game there, Houston got beat up when they visited the Impact and even San Jose dropped a game there. Lucky for Sporting they are one of the few clubs that knows what it takes to beat Montreal in Montreal. They did it earlier this season in a big 3-1 win. Replicating that win won’t be easy with the Impact still in the hunt for a playoff spot. Montreal is on desperation mode here at the moment and they know that three points are a must no matter what. Expect a cagy game because of that. 3. Can Salt Lake get back on track? I’ve said it a couple times, the last few weeks for RSL haven’t gone too well. LA has even (slightly) passed them in the standings when you factor in the new tiebreakers in MLS. They scored a nice win on Tuesday in Panama in the CCL, which has to get their confidence back on track. The question will become, can they do it in the league again? In a way, they should have no issues getting their swagger back this weekend as they host Portland. The Timbers have struggled on the road this season and Rio Tinto has always been a tough venue for anyone, let alone a team that could still finish near the bottom of the league table. Salt Lake has to get guys like Javier Morales back and in his old MVP form. Same goes for scorers like Will Johnson and Fabian Espindola. We know Alvaro Saborio can score loads of goals here but he can’t be called it do it all alone. Someone has to step up and help out for RSL’s MLS Cup hopes here. 4. Battle in the Windy City. Boy, the game of the week has to be the Chicago Fire hosting the Columbus Crew. Yeah I know there are other big ones but this one certainly has the makings of being a big time battle. Chicago now sits four points back of Sporting Kansas City and they know that they must continue to win as they push for home field advantage in the playoffs. Columbus on the other hand has a battle of their own to deal with. Even with last night’s win over Chivas USA, the Crew still have to fight off D.C. United and Montreal for the final playoff spot. A win in Chicago however will put pressure on New York and Houston to get results this weekend as well. It goes without saying, this one is big. I have a feeling this one will come down to a defensive mistake. Both sides have quality in the back but each team has some holes that could creep up in a big game. Columbus has to play a smart game and push the Fire into a corner. Chicago loves to go with tempo and will be looking to take the game right to the Crew from the start. 5. Sounders and Quakes battle it out. I know some will say that this is the game of the week and really I don’t have too many arguments about that even though I am more pumped to watch Chicago and Columbus. This one is all about seeing San Jose push for the Supporters’ Shield crown more than anything else. Seattle is still nine points back of the Quakes after last night’s draw for San Jose with Portland. Seattle has a simple mission in this one, just get points. Given how the West is going here they need points to hold off LA and Salt Lake. They definitely don’t want to start to slip up here. The edge has to be in the legs of the defense for both sides. We know that Chris Wondolowski is back and scoring after last night and we know that Eddie Johnson will be sitting this game out thanks to a yellow card accumulation. Fredy Montero and Mauro Rosales will have to turn it on to keep the Sounders in this one, which I think they will at home. 6. Vancouver has the keys in 5th place race. As I wrote earlier in the week, the final playoff spot out West is all in Vancouver’s court. They begin a nice home stand with four of their final five games at BC Place. Up first is the Colorado Rapids, a team that has been dreadful since the start of summer. All Vancouver has to do here is win. Simple as that. A win gets them a little further away from FC Dallas in the standings and causes the pressure to go right back to Dallas to win their final four games. A loss however for the Caps makes things much more difficult to finish out the season. It isn’t the schedule that I am talking about for Vancouver, it is their confidence to get a result. At this point they have scored one goal since the start of August and haven’t seen a win since the end of July. That’s a drought no matter how you look at it. Something will have to give for them at home here but another loss to start off this home stand will make matters really difficult. Consider this as well, Vancouver’s 29 goals puts them just above Chivas USA (21) and Philadelphia (26) for fewest goals scored this season. Ouch – that has to change if they want to reach the post season.